By: Justin Zablocki (author, Zablocki Bros. LLC) on September 9th, 2013 12:00 AM. Doctor Who originally aired on BBC in 1963 and was meant to be a show for the whole family because it dealt with science and history. Since the 26 seasons, 7 series, and one large break of Doctor Who it has gotten countless awards including several BAFTA TV Awards and millions of viewers. The mystery of Doctor Who makes this show a perfect setting for riddles. Here are some of the riddles of Doctor Who. I'm something borrowed, I'm something blue; You stole me, and I stole you; I'm quite old and not quite new; End of the world, what to do? This riddle comes from the episode "The Big Bang" (series 5, episode 13). In this episode the Doctor has been locked in Pandorica, a prison built for him by his enemies. After an elaborate plan he manages to 'reboot' the universe and escape the prison. This riddle is referring to the TARDIS, Amy finally figures this out when the Doctor shows up with the TARDIS on her wedding day. The next riddle comes from the episode "The Celestial Toymaker", the sixth series of the third season. At the end of the episode there are three riddles Steven and Dodo must solve. Four legs, no feet; Of arms no lack; It carries no burden on its back; Six deadly sisters, seven for choice; Call the servants without voice. Hunt the key, to fit the door; That leads out on the dancing floor. Then escape the rhythmic beat; Or you'll forever tap your feet. Lady luck will show the way; Win the game, or here you'll stay. The first two are riddles given by the Toymaker and the last one was given by the Doctor. The first riddle is referring to seven chairs in two rooms, by sitting in six of them you will be killed. The servants are life-sized dolls found in TARDIS shaped cupboards. The second riddle refers to a literal key that is hidden in a pie and then they go to a dance floor where the creepy dolls dance with Steven keeping him and Dodo from the Tardis, but they make it out alive. The final riddle isn't really much of a riddle, it just means they have to win the game to escape. The next riddle comes from series 6, episode 4 ("The Doctor's Wife") and are the last words of Idris. Originally these words had only speculative meaning but they were explained in "A Good Man Goes To War". 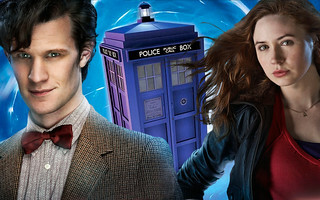 In this episode you find out that the riddle meant that River is Amy Pond's daughter. The people of the Gamma Forest don't have a word for "Pond" so it was translated to River. For more information about this visit the Wikepedia page. Then there is the biggest riddle of all. What is The Doctor's name? This riddle may never be solved but it has been the topic of a lot of recent discussion with the recent episode "The Name of the Doctor". But really this was just a ploy and didn't reveal anything relating to his name. I hope you enjoyed these riddles! For more riddles go to funny riddles.